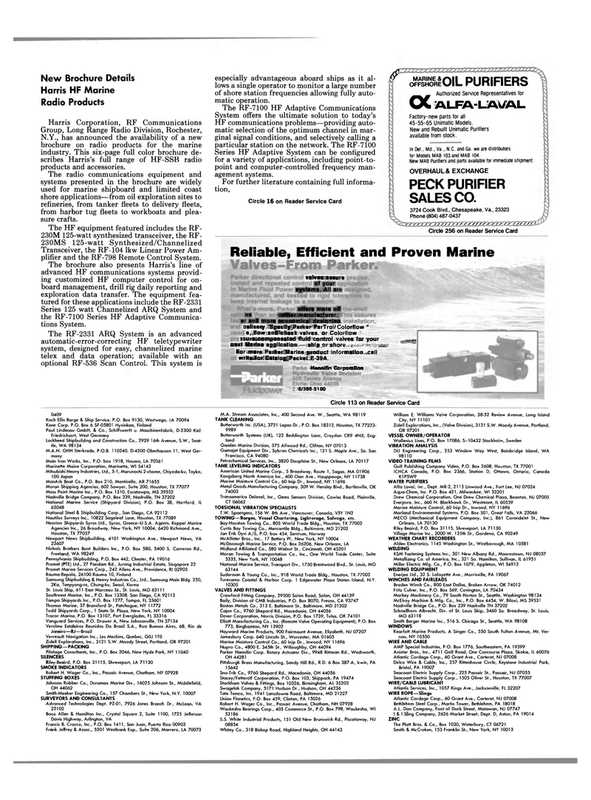 N.Y., has announced the availability of a new brochure on radio products for the marine industry. This six-page full color brochure de- scribes Harris's full range of HF-SSB radio products and accessories. The radio communications equipment and systems presented in the brochure are widely used for marine shipboard and limited coast shore applications—from oil exploration sites to refineries, from tanker fleets to delivery fleets, from harbor tug fleets to workboats and plea- sure crafts. Transceiver, the RF-104 lkw Linear Power Am- plifier and the RF-798 Remote Control System. Series 125 watt Channelized ARQ System and the RF-7100 Series HF Adaptive Communica- tions System. The RF-2331 ARQ System is an advanced automatic-error-correcting HF teletypewriter system, designed for easy, channelized marine telex and data operation; available with an optional RF-536 Scan Control. This system is especially advantageous aboard ships as it al- lows a single operator to monitor a large number of shore station frequencies allowing fully auto- matic operation. Series HF Adaptive System can be configured for a variety of applications, including point-to- point and computer-controlled frequency man- agement systems. Factory-new parts for all 45-55-65 Unimatic Models. New and Rebuilt Unimatic Purifiers available from stock. In Del., Md., Va., N.C. and Ga. we are distributors for Models MAB 103 and MAB 104. New MAB Purifiers and parts available for immediate shipment.